I have been wanting to shoot a Mount Sanitas engagement session at sunrise for years now. As one of the busiest trails in Boulder, there aren’t a lot of good times to shoot up here without having tons of fellow hikers around. But sunrise is my favorite time of day, and the only time of day I hike Sanitas, and it’s always less crowded in winter as the trails get icy. 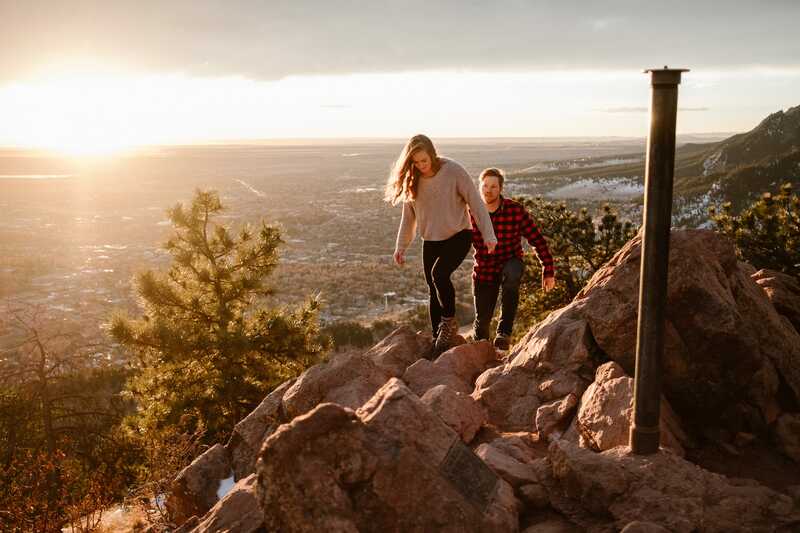 When Rachael and Ben reached out about photographing their Mount Sanitas engagement session, they were completely down for starting the short but steep hike in the dark to catch sunrise from the summit – and to beat the crowds. I met up with them and their dog Mishka at the Centennial Trailhead in the dark on a Wednesday morning, and we started the hike with our headlamps leading the way. One of my favorite parts of this Mount Sanitas engagement session is actually not even in the photos, but in how all three of us were in awe of the pink and orange colors that lit up the sky as we got closer to sunrise. I just love looking out on the Boulder city lights from up on the trail, and seeing Denver looking all tiny in the distance. Sanitas may be a short trail at only 1.3 miles each way to the summit if you follow the Mount Sanitas trail along the ridge, but with around 1,300ft of elevation gain, it feels like hiking a stairmaster. We took some stops along the way to throw sticks for Mishka, but kept pushing on to make sure we were at the summit before sunrise. I wasn’t sure what speed to expect when hiking for a Mount Sanitas engagement session, but we got up in around 45 minutes. 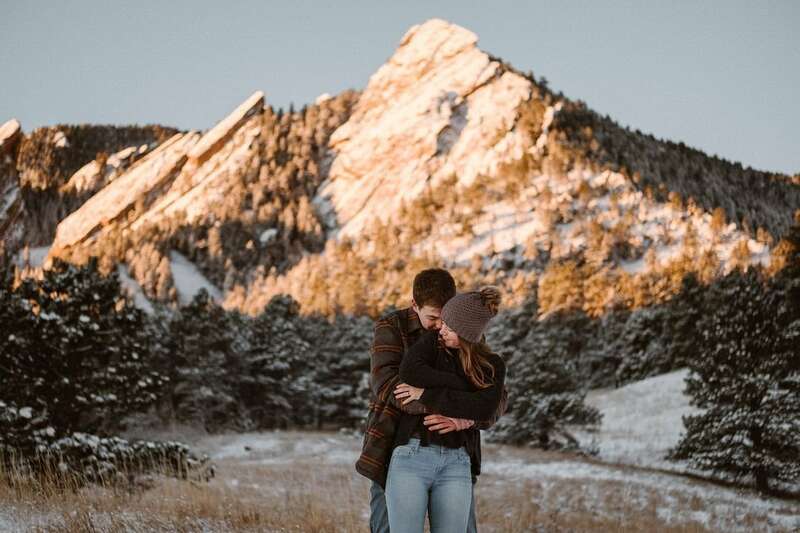 If you want Mount Sanitas engagement photos, or to hike one of Boulder’s many gorgeous trails for your photos, contact me and let’s make it happen! 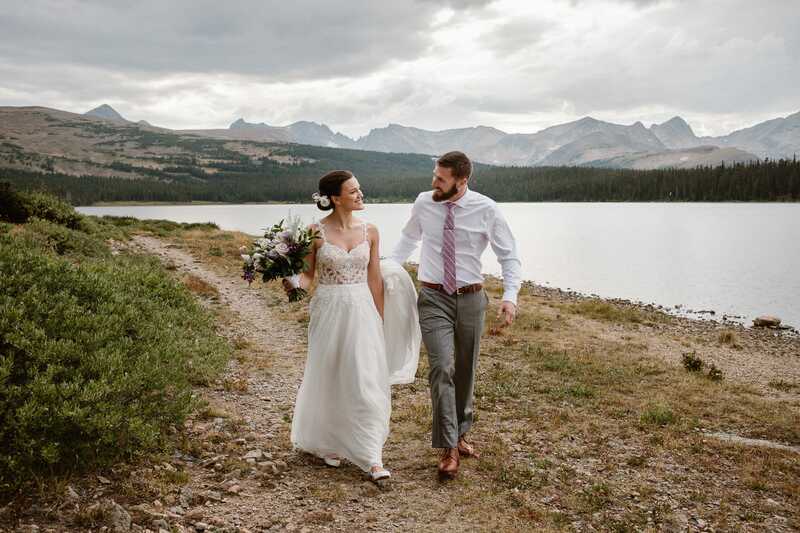 Check out more of my Boulder sessions, like this sunset session at Betasso, a Boulder Reservoir couples session (with dog photobombs), a sunrise session with trail running, hiking at Bald Mountain,and an engagement at Marshall Mesa.